Project Brief: TSpark Enterprises is a construction company located in Tallahassee, Florida. TSpark specializes in residential and commercial roofing and interior buildouts of businesses. They started their business in 2013 and recently they decided to take their online presence to the next level. When TSpark came to Web Centre, they didn’t have a website at all. Meaning that this would be their first experience with a website design company in Tallahassee. We met with them and went over everything their business should have, what functionality there website would need and learned everything we could about their business. The result of these meetings was something perfect for their company. 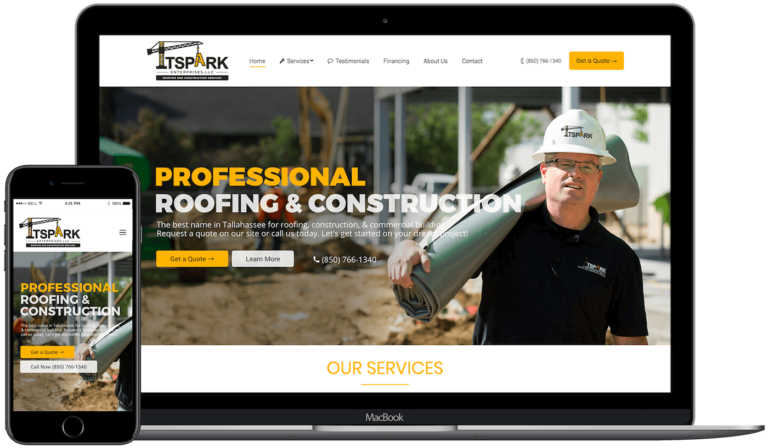 Web Centre designed TSpark a website that fits their incredible branding, the feel of the business, and gave them a very modern, sleek look online. Then we took it further – adding functionalities for customers to get a quote from TSpark online. This helped to generate a constant lead source for their business – their website. Today, we manage their website for them – giving them updates to the website every month, along with backing up their site everyday and sending them a free monthly report to go along with it.